Home | The Other Side of Green! The Paris climate talks at the end of 2015 no doubt left some feeling as though global politics might just have turned a little green. With a climate agreement aiming to keep the global temperature increase to less than 1.5°C, national governments have some heavy lifting to do in cutting emissions to ensure a fair and livable world. The green economy – including carbon markets and other payments for ecosystem services – is being championed as the “solution” to meeting this target, alongside expanding the renewable energy sector. Reducing Emissions from Deforestation and Forest Degradation (REDD) and related projects, with a strong focus on developing countries, are part of what Naomi Klein (2014) refers to as the new “Gaia capitalism.” In this brave new world, making money is directly tied to saving the planet. In this article, we report on research and action that occurred between 2012 and 2015, focused on the activities of a multinational company operating in Uganda and trading in carbon markets. Our story adds weight to the growing chorus of voices opposing the rollout of Gaia capitalism as a response to the climate crisis and highlights the power of people in forcing global corporations to change their practices. 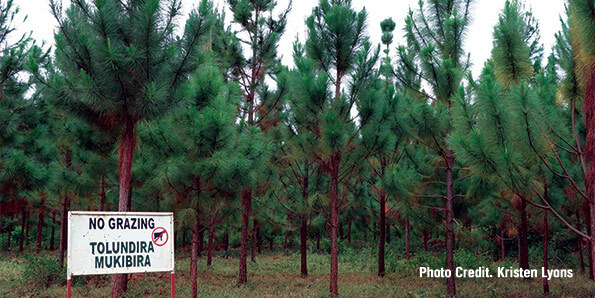 Our research examined one of the largest plantation forestry companies operating on the African continent, Green Resources. On the basis of nearly eight months in the field visiting villages directly affected by the company, we documented the “carbon violence” on which establishing forestry plantations for carbon offset relies. This work was recently published by the Oakland Institute in a report called “The Darker Side of Green” ’, (www.oaklandinstitute.org/darker-side-green). Our work describes the extent to which communities have historically relied on the land that is now licensed to Green Resources for vital livelihood activities, including grazing animals, cultivating food crops and accessing sites of cultural significance. Yet these peasant farming families have now been constrained and/or denied access to this land, with acute outcomes for their lives and livelihoods. We met many villagers who described moving their livelihood activities onto more marginal (and less productive) land, such as moving grazing animals onto wetlands, riparian and other ecologically sensitive zones, and moving crop cultivation onto steep and rocky slopes. Yet in recent months, the failure of Green Resources to live up to its own claims of corporate social responsibility has caught up with it. In a win for people and the planet, the company’s failure to comply with its own ideas of best practices and international standards has been exposed as paltry in terms of regulatory usefulness – resulting in the company being locked out of the international carbon market, for now at least. After mounting pressure over many years of research and advocacy by international non-government organizations (NGOs), in September of 2015 a Swedish television crew traveled to one of the sites Green Resources operates in Uganda to learn more about the company’s social and environmental impacts. Their story, “The Forbidden Forest,” ran on Sweden’s Channel 4, reporting on community members’ loss of access to land vital to grow food, graze animals and secure access to safe drinking water. The response to this story, building upon ongoing research over a number of years related to Green Resources, has been significant, showing intolerance to companies who cut corners to enter the carbon market. The Swedish Minister for Climate and the Environment, Asa Romson, has spoken out strongly against Green Resources’ conduct. In response, the Swedish Energy Agency has frozen payments until significant changes in corporate practices are made, including enabling community members to access land to grow food crops and graze animals, recognizing local peoples’ land rights, and introducing improved grievance mechanisms, road maintenance and more. Sweden’s response sends a clear message to the world: climate solutions that ignore the rights of local peoples are not acceptable. This is a concern that organizations, such as the Indigenous Environmental Network, Friends of the Earth International, Timber Watch and the No REDD in Africa Network, among others, have raised for many years. In championing the financialization of nature through carbon markets, the recent global climate agreement ignores the violence on which it is so often built. At the same time, it ignores the fact that carbon markets fail to address the key challenge of reducing greenhouse gas emissions. While governments are distracted by the lure of carbon markets, fundamental concerns about the voluntary and non-binding nature of the agreement rise. So, too, do criticisms of its failure to make compensation provisions for the world’s most vulnerable communities already affected by climate change, as well as its sidestepping calls to take a position to end coal mining for fear of causing offense. For now, we are waiting to see what this global plantation forestry company will do in response to being locked out of the carbon market. With its poor practices recently exposed, now is the time to write to Green Resources demanding that they take seriously the requirements outlined by the Swedish government. Add your voice to this campaign; write to Green Resources today, and let them know how important it is to you that they do so. Poor people in Uganda, and in other developing countries, cannot be shortchanged in the flurry of excitement around carbon trading initiatives. Children living in a village located within the area licensed to Green Resources. Children collect water from Lake Victoria. Letters can be sent to Green Resources Board Member Kristoffer Olsen at: [email protected]. To watch the full version of “The Forbidden Forest,” screened on Channel 4 in Sweden, please visit: www.youtube.com/watch?v=COoPVXlNbqQ. Newsletter 153: Action Alerts: Solidarity with Apparel Workers and Palm Plantation Workers!